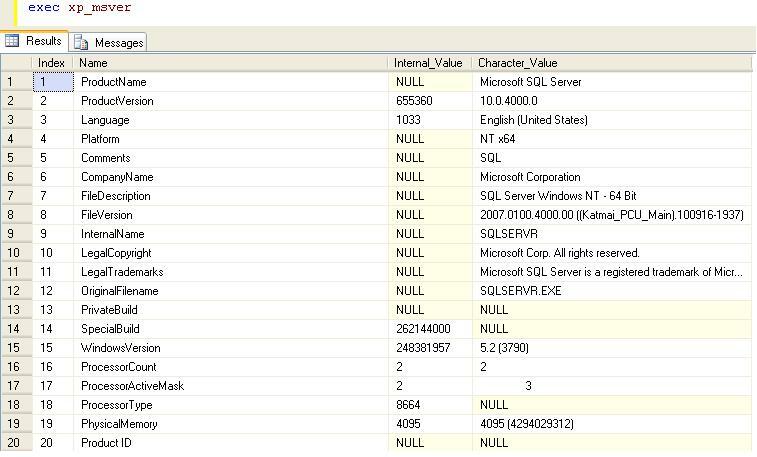 xp_msver returns information about the SQL Server version, actual build number of the server and information about the server environment. You can also pass the parameter to get the specific information. This entry was posted in SQL Server, SQL Server 2008, SQL Server 2008 R2, SQL Server 2011 (Denali) and tagged Configuration Parameters, SQL Configuration, SQL Properties, T-SQL Script on December 8, 2011 by Jugal Shah.